One Channel 11 KTVF news clip and three interviews of George Attla were provided courtesy of the KTVF Collection of Alaska Film Archives – University of Alaska. The Alaska Film Archives, located at the University of Alaska Fairbanks, holds the largest collection of film-related material about Alaska. Established in 1968, the archive consists almost entirely of 16 mm film dating from the years 1920 to 1959. Since 1993, the archive has been maintained as a unit of the Alaska and Polar Regions Department in the Elmer E. Rasmuson Library. To learn more, go to http://www.library.uaf.edu/film-archives. Jack Benson of KTVF Broadcast Center Sports visits George Attla in North Pole after a training run. 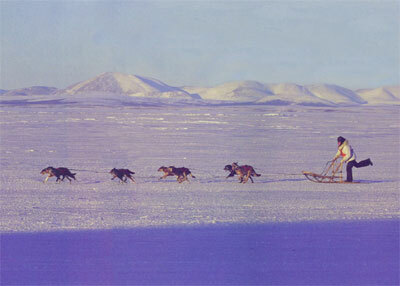 Referring to George as the Huslia Hustler, he summarizes George’s racing career and his business of selling sled dogs. George answers questions about his moving to North Pole, his new sponsorship with BP Alaska, and the cost of raising and racing a dog team. George comments on the dogs in his kennel, predictions for the 1973 sprint sled dog racing season, and his hopeful participation in the first Iditarod. George Attla answers questions about his dogs and predictions for the 1975 sprint sled dog racing season. He shares details about the number of exceptional dogs in his kennel. George talks about his luck with breeding- he has his own very good dogs right now. He shares that he makes a living selling dogs mostly out of state and in Canada. He tells stories about dogs he’s sold. George gives credit to his brothers and his friends in the village as sources of good dogs when he needs them. Interview continued in Part II. Interview continued from Part I. George says has 24 exceptional dogs in his kennel. They are exceptional because they have been working really well together as a team and running like they have a fire under them. He compares his team now to his winning team of 1972. George lists all the races he plans to run in Alaska and lower-48. He shares his racing strategy for the season. He answers a last question: Why do you mush? A broadcaster interviewing George Attla tells about the race. He asks about the loaned dogs in Carl Huntington’s winning team. He also asks more questions about loaned dogs in George’s team. George comments on his team’s good performance, but says it’s coming up short on the last 30-mile heat. He acknowledges Alaska International Air as his sponsor. In a short interview, a broadcaster sums up George Attla’s racing record of the season and then asks him to predict his place in the upcoming Open North American World Championship. George jokes that he’ll try to get around the track for 3 days. He shares that he is using a couple of new leaders and will race a good team of only 12 dogs. George is not worried about the competition and says he’ll just do the best with the dogs he has.